As a teacher my favorite part of it all is the kids. They are great---smiles, laughs, hugs, funny things they say, the way they surprise me with ideas and so much more. Never did i even think of being in the position that I would experience what happened this year; and specifically Monday, January 10th, 2010. 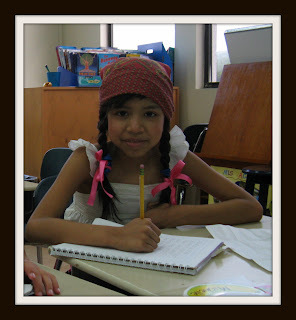 After an 18 month fight with cancer, a sweet girl in my class named Michelle, passed away. Just typing these words wrenches my heart and calls tears to my eyes. I didn't even want to answer the phone Sunday evening, seeing my principal's number because of my fear of what I would find out. It is quite hard to think of not seeing her again. Today was difficult to keep my composure while still going through the motions at school. We are trying to remember her, honor her, and pray for her family. I thank the Lord that she is no longer sick and suffering like she was the last few days, but that doesn't seem to replace the sadness in my heart quite yet. She had a great smile and smiled often. She had great fashion sense and wore wonderful hats while her hair was growing out. She was beautiful--inside and out. She was a great friend; loyal and kind. She was great at drama. Michelle experienced so much in her short life and I am so glad to have known her and her family. I hope you will join me in praying for her family: mom, dad, little brother, and older sister. Pray that the Lord will comfort them through this hard time. That they cling to him and know that Michelle truly is feeling no more sorrow and no more pain. one of her really cool hats--this one even had built in braids! :) How adorable is she?! I wish I was there to hug you and hold you.... I can't even ( nor do I want to) imagine what it is like to loose a daughter. LOVE YOU SWEETY! Oh Julia I am just so sorry you had to go through this. I can tell just from looking at her pictures how full of zest and life this little girl was. Oh friend I am so sorry. Wish we could be there for you right now. What a heartbreaking situation to deal with=( Praying for you and for her family. What a beautiful girl!! Thanks for sharing your lovely heart, Julia... praying for her family, for you, and your classroom full of tender kiddos.